Overview Producer sends Submission Information Package (SIP) to Receive Submission; Quality Assurance validates transfer of SIP to Receive Submission; Generate AIP prepares Archival Information Package (AIP); Generate Descriptive Infomation generates Descriptive Information; Co-ordinate Updates sends AIP to Archival Storage>Receive Data and Descriptive Information to Data Management>Receive Database Updates. Successful outcome Coordinate Updates submits Descriptive Information to Data Management>Receive Database Updates, sends AIP to Archival Storage>Receive Data and sends AIP to Archival Storage>Receive Data. OAIS, page 2-9, section 2.3.2: "The first contact between the OAIS and the Producer is a request that the OAIS preserve the data products created by the Producer. This contact may be initiated by the OAIS, the Producer or Management." 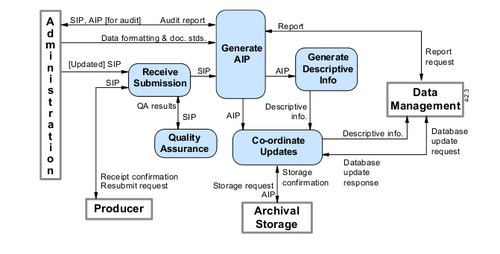 OAIS, page 4-1, section 4.1: "This entity provides the services and functions to accept Submission Information Packages (SIPs) from Producers (or from internal elements under Administration control) and prepare the contents for storage and management within the archive. Ingest functions include receiving SIPs, performing quality assurance on SIPs, generating an Archival Information Package (AIP) which complies with the archive’s data formatting and documentation standards, extracting Descriptive Information from the AIPs for inclusion in the archive database, and coordinating updates to Archival Storage and Data Management." OAIS, page 4-10, section 4.1.1.5: "The Negotiate Submission Agreement function solicits desirable archival information for the OAIS and negotiates Submission Agreements with Producers. This function also negotiates a data submission schedule with the Producer. It maintains a calendar of expected Data Submission Sessions that will be needed to transfer one or more SIPs to the OAIS and the resource requirements to support their ngestion." This page was last modified on 4 September 2009, at 16:30.